The Dow Jones Industrial Average today pared gains after a massive "Black Monday" rebound saw the market climb as many as 441.5 points. The Dow Jones Industrial Average and S&P 500 both slid into negative territory during the last 30 minutes of the trading session, one day after the Dow's worst three-day decline in its 133-year history. 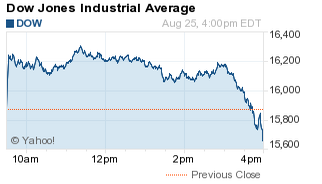 The Dow finished down more than 205 points on the day. This morning, the Chinese central bank announced it had slashed interest rates and reduced the amount of money required for reserve banks to hold for the second time in just two months. The S&P 500 Volatility Index (VIX), the market's fear gauge, fell more than 7% on the day, but it still remains high at 37. Stock Market News: The markets cratered in the last 30 minutes of trading, with the Dow Jones, Nasdaq, and S&P 500 falling on the day. It was the largest one-day reversal since October 2008. Concerns about global economic growth are rattling investors. Recent data suggests the Chinese economy is slowing, prompting the nation's central bank to slash interest rates for the second time in just two months. The Shanghai Composite Index cratered again on Tuesday, with the market falling more than 15% in two days. Despite worries about the world's second-largest economy, economic data in the United States suggests continued growth and optimism. U.S. consumer confidence struck a seven-month high in August, while new home sales recovered in July.